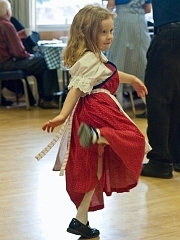 The Katrilli Finnish Folkdancers entertain at a pancake breakfast. Photo by Martin Ng. See more photos. By far one of our most popular and famous events, every first Sunday of the month we serve up authentic Swedish pancakes for our members and our friends in the community! The pancake breakfast is open to the public, so come and experience what is often imitated, but never quite done right. In addition to Swedish pancakes, there's music and folk dancing, good friends, and real Swedish coffee. Everyone is welcome! Adults: $11. Club members $9. Children 5–12: $5. Children under 5: FREE. If you would like to volunteer and help at the pancake breakfast, please and let us know! For more about our pancake breakfasts, read the cover story from our November 2008 newsletter. P.S. In the event that you can't join us for pancakes, you can always try our recipe for yourself at home. Oh, and it took us a while to catch on, but apparently blogging about our pancakes is something of a local obsession. Believe us, these are great pancakes—but if you don't believe us, perhaps you'll believe Joey Veltkamp, The Seattle Times (not	once but twice),	Seattle P-I, KCTS 9, Seattle magazine, The Washington Post, Culinary Fool, Findwell, or eight out of nine reviewers at Yelp.